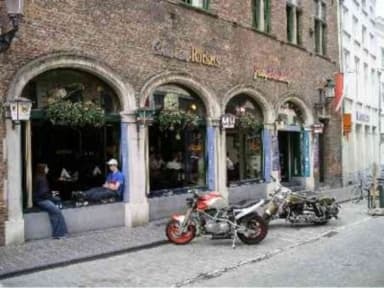 Charlie Rockets i Brugge, Belgia: Bestill nå! the definite roominglist of the groupbooking has to be sent to the hostel one week before arrival. the definite amount of beds needed has to be sent to the hostel one week before arrival. We are located in the old centre and it's only 1 minute walk form the mainsquare! We have a famous Italian restaurant inside, where they have fresh pizzas and pastas. During your stay in the hostel we offer a FREE BEER with your meal in our Italian restaurant Carlito's. In the bar you will find 5 pool tables, a dartboards (No charge) and a fussballtable. Our staff serve many local Belgian beers, and if you like a cocktail, our barman Leo make 1 specially for you! In the bar and the rooms we have WIFI (NO CHARGE). From October untill May you can enjoy some great live concerts in the weekend! (NO CHARGE).